I mentioned spoilers above, but please realize that the only way I could spoil this movie is by suggesting that you watch it. Picture this: fedoras, 1930s cars, submachine guns, pretty women, and Christian Bale clenching his jaw while inexorably tracking down an insouciant and gallant Johnny Depp. There. You just experienced the best this movie has to offer and if that were all, I would probably be its biggest fan. Unfortunately, there is more and, what is more, more to hate. This movie is more self-conscious than a bald man in a barbershop. The camera was so distracting that it should have been given a name and listed in the credits in the role of “drunken eyewitness.” I could speculate that the director was going for a docudrama style, but that would be mere guesswork. What is certain is that there were several scenes, throughout the movie, where the action was framed in an incredibly distracting way. For example, twice, a straightforward walking dialogue shot was framed so tightly that the actors bounced up and down in the screen. Not only did it make them look like they were walking on springs, it distracted from the actual dialogue. I literally gasped in horror at later instances of camera shake so severe that I immediately pictured the camera operator, jacked up on energy drinks and suffering from muscle fatigue looking down at his watch and heaving a sigh as he realizes that lunch is still two hours away. This is an example of the medium distracting from the message in an unacceptable way. Watching it was like reading a book printed on insect wings – it’s hard to pay attention to the story when you’re wondering what the heck the publisher was thinking. The camera work was not the only thing that marred the movie for me. Throughout, I kept noticing that the locations were sets, the clothes were costumes and the characters were modern actors – it all just wasn’t believable to me. At first, I couldn’t figure out why, since there was nothing really wrong with the props and acting, but just now, I had an epiphany! The reason I wasn’t convinced by Public Enemies is because I have watched so many movies that were actually made in the 1930s and ’40s. Compared to the acting styles of that age, modern actors’ mannerisms, intonations and body language seem blaringly anachronistic when set in the ’30s. At various intervals, a character would appear in Public Enemies who would be jarringly 21st century, despite a convincing costume. Why is this? I think it bears further analysis, but by someone more informed than I. I would be interested to hear the opinions of other people on this topic. Have others watched movies and noticed actors that do not fit the time period for some indefinable reason? You may consider the previous points to be demented rantings on issues that don’t affect the average moviegoer, but let me give you a real rant about an issue that almost everyone would consider irrelevant. At the end of Public Enemies, Dillinger goes to see a 1930s Clark Gable gangster movie, Manhattan Melodrama. Clark Gable is cool, but I was more excited by the fact that this movie also starred William Powell and Myrna Loy, two of my favourite 30s actors, whom I have seen in numerous movies. I couldn’t believe it when Public Enemies included spoilers for Manhattan Melodrama in the scene! Why is that okay? How would Michael Mann feel if a director of the future included pivotal scenes from Public Enemies in a movie? It’s a disrespectful and cheap act. 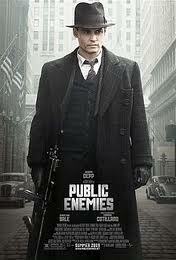 Overall, I think that Public Enemies makes a good poster – crisp, pretty, atmospheric, and two-dimensional. The lack of character development and prevalence of clichés makes it seem that the main goal was to cash in on the popularity, action, romance and drama of the gangster genre. The characters were all archetypes we’ve seen a million times before – the morally ambiguous antihero, the loyal moll and the hardnosed lawman. If you want to watch a gangster movie with classic characters and storyline, then why not step outside your comfort zone and watch the originals. Sure they’re in black and white and the actors are unrecognizable, but consider it an education. But wait, there’s something more! 1. Tinted glasses and a tiny mustache shall be sufficient disguise for notorious criminals. 2. Ammo is unlimited and the enemy are bad shots, but keep in mind that your friends, unlike you, are not playing on God Mode and will be killed at regular intervals. 3. Women transform into willing accomplices if called “Doll,” “Sister,” or “Darling” and given a hideous fur coat. 4. Wanted. Bank Manager. Must be skilled at unlocking vaults under coercion and being used as a human shield. 5. Females with criminal friends may, with minimal interference from the authorities: date them, harbour them, lie to the police for them, spend their stolen money, or betray them. However, females must under no circumstances accompany them on missions, carry a gun, or help them escape from jail. 6. Notorious criminals on the run should under no circumstances significantly alter their appearance, such as by cutting their hair. 7. All you need to break out of jail is a wooden gun and a large man with a stick (sounds like the beginning to a great country song). 8. As a general rule of thumb, you must offer a lady your coat once for every four men you murder in order to keep in the public’s good graces. 10. It is good form to have at least one epic train robbery in the works. Whether the heist actually happens is entirely irrelevant. 11. Three men in dark suits and fedoras can strut into a bank with their hands in their jacket pockets, look around forbiddingly and spread out to cover left, right and center without raising suspicion. 12. Even hardened killers like to snuggle sometimes. Just remember, it doesn’t have to be with you. Unless he says it does. 13. Your escape vehicle should have approximately four too few seats, since some of the gang members are required to stand on the running boards, clutching the vehicle with one hand and ineffectually shooting Thompsons with the other. 14. The guys with the chevron moustaches are up to something. 15. A movie theatre is an acceptable place to meet and hatch schemes. 16. If your double shoulder holster suddenly seems too formal, throw a handgun into your trouser pocket.